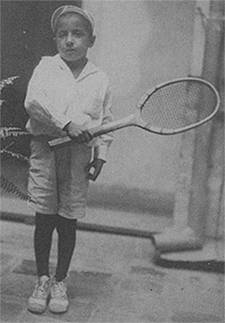 Francisco Segura Cano, age 12. Nobody noticed the small dark skinned boy in a corner of the Guayaquil Tennis Club, hitting ball after ball against the wall with a dilapidated looking tennis racket. The boy was alarmingly thin, with bandy, skinny legs that curved in like bananas, and slender arms with fragile wrists, so fragile that in order to stroke the ball hard enough for it to bounce back from the wall, he had to keep both hands on the handle of the racket. To the few members of the club who might have glanced at him as they left the court and prepared to go back to their expensive homes for a shower and a drink, he was just another poor little kid from the barrio who was passing the time while waiting for somebody to take him home. They would have been mistaken, and if they had paused to look at the little boy more carefully, they might have realized their mistake. For the child's expression was one of fierce concentration and focus. He was not just passing the time. He was practicing hitting tennis balls the only way he knew how-by doing it over and over again with a passion that belied his young age. What was reflected in that boy's eager, intent face was what audiences all over the world would come to know and thrill to one day. As it grew dark at the club and long shadows made it difficult for the boy to see the ball anymore, a tall, strongly built man came from the courts where he had been tidying up, collecting towels and balls, unwinding the nets, locking doors, and closing up the club. "Panchito, let's go home."